The Music Department’s Undergraduate Advising team – Roger Zahab, Director, and Susan Rice, Associate Director, provide advising and mentoring support to all Music majors and minors, as well as musical students from throughout the University. Most of our faculty actively mentor students in directed and independent studies, performances, ethnographic and interdisciplinary research. 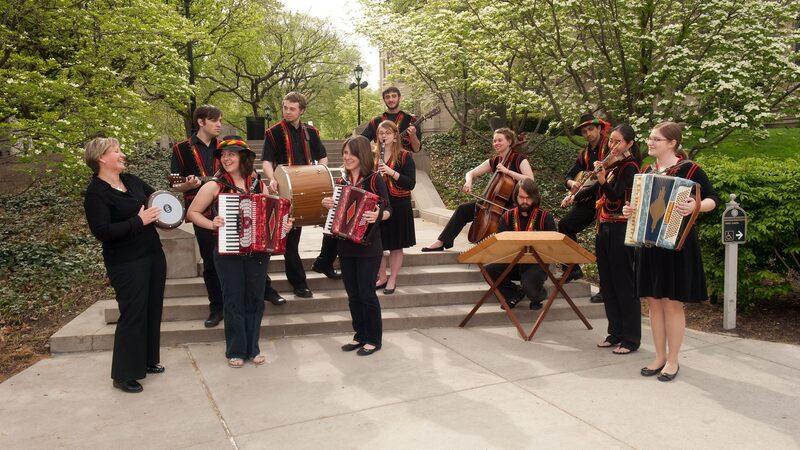 For instance, students have pursued studies of Qur’anic recitation in Egypt, Roma music and culture in Eastern Europe, the study of West African culture and society through Pitt in Ghana, and creative opportunities as arranging and composing for large performing groups like the University Symphony Orchestra, and the Carpathian, African Drumming, Pitt AfroPop, and Gamelan Ensembles. The Music department performance ensembles also provide a very high degree of student-faculty engagement. The Heinz Chapel Choir and Pitt Men’s Glee Club regularly undertake tours in the United States and abroad, and the Symphony Orchestra and University Bands perform in and around, as well as far outside of, Pittsburgh. As an advisor, Associate Professor Adriana Helbig was open-minded, supportive, and knowledgeable. My research focused on the transgression of gypsy prejudices through immigration to Pittsburgh at the turn of the 20th century. Throughout my research process, Dr. Helbig displayed authentic interest in my work by providing detailed and specific feedback as well as targeted suggestions to improve my research in both the planning and revising stages. For example, prior to submitting my project application, Dr. Helbig helped me streamline my research ideas into a unique, cross-discipline proposal by meeting with me several times, providing research sources, and focusing on my strengths and interests as a student. She also willingly edited my research paper abstract; I was later accepted to two national conferences to present my research through submission of this abstract. Overall, it was an immese pleasure working with Dr. Helbig.